AcroPlot Suite is has been one of the most advanced CAD to PDF solution available on the market since 2001. 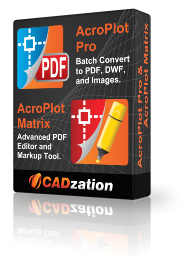 With AcroPlot Pro to convert various formats to PDF, DWF, and image formats, AcroPlot Matrix to edit and markup PDF files, and one of the highest quality PDF Printer Drivers we have all of your needs covered. is the next generation in digital CAD conversion software. With the capability to convert an extensive list of file formats to PDF, DWF, and images AcroPlot Pro will serve as a nexus for CAD Professionals everywhere. DWG, DXF, DOC, TXT, RTF, XLS, BMP, CALS, JPG, GIF, TIFF, PLT and more. AcroPlot Matrix is quickly becoming the preferred software application for PDF communication across entire organizations because it is so flexible and easy to use, as well as, cost effective to deploy. It works well in all departments like administrative, estimating, accounting, legal, parts, maintenance, etc. !